This release will provide the new user management features to instances that were not part of the rollout earlier in the year. If your instance is affected by this change, you will receive an email from Atlassian with information about these changes, as well as a banner in your instance. You can also read all the details on this release of user management features here: User Management FAQ - May 2014. We've changed the Create Issue button to simply Create. This brings us in line with your other OnDemand products, and also gives you a little more room on the top navigation bar in JIRA. Project administrators can now add versions and components from within the Fix Version/s, Affected Version/s and Component/s fields. When you begin typing text that JIRA does not recognize as existing, it will add it to the bottom of the drop-down list and add (New Version) or (New Component). An awesome time saver! Creating a new version 6.3. When linking the repository configuration during the creation of a plan, the repository configuration is no longer stored against the plan configuration. Source repositories linked during plan creation are now available globally to all plans and jobs configured on the Bamboo server. This will save you from having to reconfigure source repositories in multiple places if these ever change — any changes to a linked repository are applied to every plan or job using that repository. You are given the option to control who has access to the linked repository during the plan creation process. When users create plans, they are only given the option to create Linked Repositories. Users will need the Create Plan global permission in order to create Linked Repositories. In the long term, Atlassian plans to deprecate the repository configuration defined against the plan. These configurations can be converted to Linked repositories by clicking the Convert to linked repository within each plan's repository configuration page. This is a major upgrade for JIRA Agile. We are making a number of changes under the covers that you need to be aware of before the upgrade. Read this blog post for details: Important notice about upcoming JIRA Agile upgrade. We're overhauling the existing reports in JIRA Agile. In future upgrades, we will be introducing enhanced versions of a number of the reports via Labs. To opt in for these new reports, enable Enhanced Reports in Labs. In this upgrade, we've introduced a new chart: the Epic Burndown. This report tracks your team's progress towards the completion of the work for an epic. The Epic Burndown is similar to the Release Burndown. 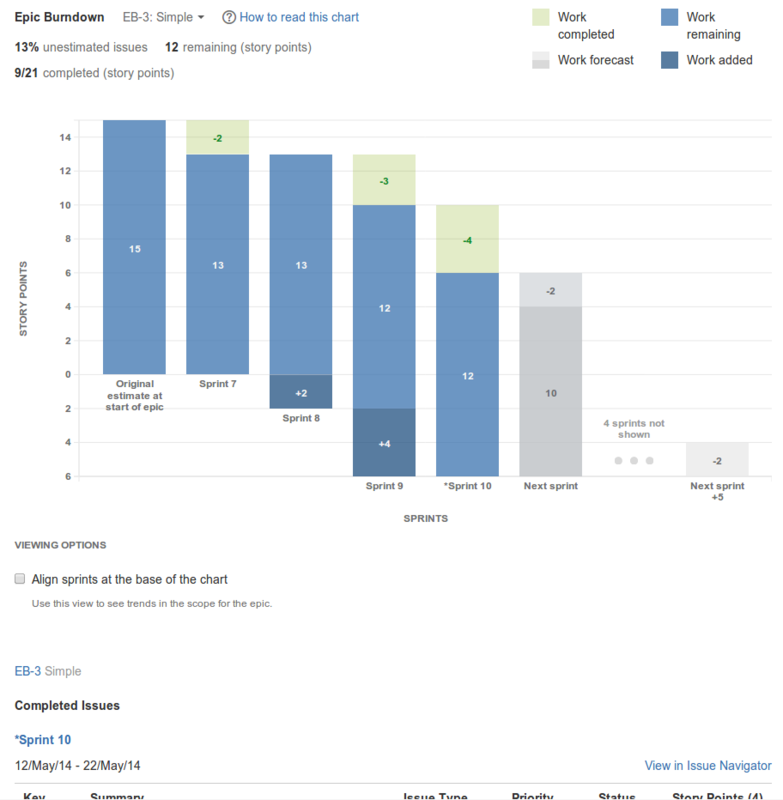 It is optimized for Scrum teams that work in sprints, and has a bar chart design that helps you see exactly what is happening in each sprint, such as work completed and scope changes. The chart also predicts the number of sprints that are required to finish the remaining work in the epic, based on your team's velocity. If you've ever wanted to find out who closed a particular sprint, you can now see this on the Burndown Chart and Sprint Report. The new Development panel will be shown on every issue in JIRA Agile if you use one of the development tools shown below. This panel helps you to evaluate the development status of an issue at a glance. If you use JIRA Agile and Confluence together, you can now create and/or link Confluence pages to JIRA Agile epics, stories and sprint reports. Read our solutions guide and try doing the following in JIRA Agile. From an epic: Create a new requirements document in Confluence (via the Product Requirements blueprint), or link to an existing page. From a sprint : Create new meeting notes in Confluence (via the Meeting Notes blueprint), or link to an existing page. From a sprint report: Create new retrospective notes in Confluence (via the Retrospectives blueprint), or link to an existing page. We're overhauling the existing reports in JIRA Agile. To opt in for these new reports, enable Enhanced Reports in Labs. So far, we've redesigned the Control Chart and introduced the Release Burndown. The Sprint field now shows the sprint name, not the sprint ID. When editing the field, you can also search for a sprint by name and JIRA Agile will suggest matching sprints (with sprints from boards /issues that you've recently viewed shown first). The Sprint field is also enabled by default and displays on the create/edit/view issue screens (users may need to show the field on the 'Create Issue'/'Edit Issue' dialog via Configure Fields). JIRA Agile now uses status lozenges to represent issue status rather than text/icons. The new status lozenges make it easier for you to see an issue's status at a glance, and look great! The lozenges also conform to the Atlassian Style Guidelines. You can also choose a Category when creating a status in the simplified workflow editor (board must be using the Simplified Workflow). The category sets a color for the status lozenge. JIRA Agile now uses the first initial of your full name (not username) as your avatar, if you do not want to upload an image or photo. This makes it easier for users to identify who is associated with an issue, at a glance, when custom images are not used. You will see these avatars on your boards (Work mode) and on the Agile wallboard gadget. If you are using a character set outside of Latin, Greek, Cyrillic, the first initial will not be shown. You will only see the colored squares. If you have enabled Gravatars, they will continue to override all avatars including "first initial" avatars. JIRA does not display first name and last name fields, only a username field, for the user profile. If you sync your users from an external directory, the username may be populated by last name+first name — hence, the first initial shown will be the first initial of the last name. Improvements to the Sprint Health gadget — Click any of the statistics on the Sprint Health gadget to drill down to detailed information on that statistic. For example, click Blockers in the gadget and you will be shown the search for blockers for the sprint. Add an issue to a sprint directly from Work mode: any issue (or issues) created during a sprint on Work mode can now be added directly to that sprint, via the issue creation confirmation dialog. Tooltip guidance when you can't create or start a sprint — Ever wondered why a Create sprint or Start sprint button/link is disabled on your board in Plan mode? You can now hover over either of these controls and a tooltip will show you exactly why it is disabled (e.g. you are not an administrator for the project, there is an active sprint). Quick Filters list in Plan/Work mode can be collapsed — Quick Filters are now rolled up into a single line, rather than spanning multiple lines. You can click the Show more link to show all filters and you can collapse them into a single line again via the Show less link. See board type (Scrum or Kanban) on the Manage Boards screen — You can now determine the type of each board when viewing them on Manage Boards screen. Improved board configuration user interface — We've updated the board configuration user interface with a number of improvements. You'll notice that the tabs have been moved into a menu on the left. We've also made a number of tweaks to clean up the Columns configuration screen. More accessible reports — Report mode now lists all available reports on the screen, instead of hiding them in a dropdown menu. Hide/Show header control moved — The control for hiding/showing the header has been moved up next to the Plan, Work, Report and Board controls, rather than next to the Quick Filters. A more discreet give feedback button — The Give feedback button won't clutter your view in JIRA Agile anymore. We still love hearing your feedback, but we've made the button a little less inconspicuous (envelope icon on bottom left of screen), so it doesn't get in your way. JIRA Service Desk will be upgraded from 1.2.4.1 to 1.2.6. We've streamlined the way how notifications work in this version. In previous versions, if no JIRA notification scheme is associated with a service desk project, no notifications are sent to customers (i.e. reporters) or agents. In versions 1.2.6, as long as the Notifications setting for JIRA Service Desk is set to ON, notifications are always sent to customers. This means that when the JIRA Service Desk setting is enabled, JIRA Service Desk controls the notifications for customers and the JIRA notification scheme controls the notifications for the other JIRA users. When the JIRA Service Desk setting is disabled, the JIRA notification scheme takes effect for all users. when there is a change in the 'status name'.